As you climb the ladder of career success, adding a CIA certification to your achievements will benefit you in many ways. You’ll be a well-rounded, more professional auditor; you’ll be prepared for career advancement; and you’ll be a trusted internal auditor who understands and can take on the challenges of business today. And because of all these traits, you’ll rightfully earn more money! The IIA’s Internal Audit Compensation Study (2017) was recently released, and its message is clear: if you have a CIA certification, your earning potential is increased. CIAs earn, on average, $38,000 more than a non-certified auditor. That’s an upgrade that makes getting a CIA certification even more attractive. Additionally, having a specialty within the internal auditor field is even more lucrative. “Salaries of U.S. auditors specializing in environmental, health, and safety grew substantially since 2015, and consistent with previous years, those with one or more certifications were found to earn substantially higher salaries than those who were not certified,” reported The IIA’s compensation study. It also reported that 73% of US organizations gave salary increases to audit staff with 2.6% increases going to certified audit staffers and 2.4% going to non-certified staffers. This information is reinforced by findings from the Robert Half Salary Guide (2016), which found that financial professionals with certifications can earn starting salaries up to 15% above the market average. And, according to the US Bureau of Labor Statistics, internal auditor salaries are slated to increase 11% until 2024. Moving up into manager and director-level auditing positions warrant better compensation. These jobs require more complex work and involve setting audit engagement plans, supervising audit staff, and interacting with management. Typically, this type of job pays at least six figures with directors earning more depending on company size. 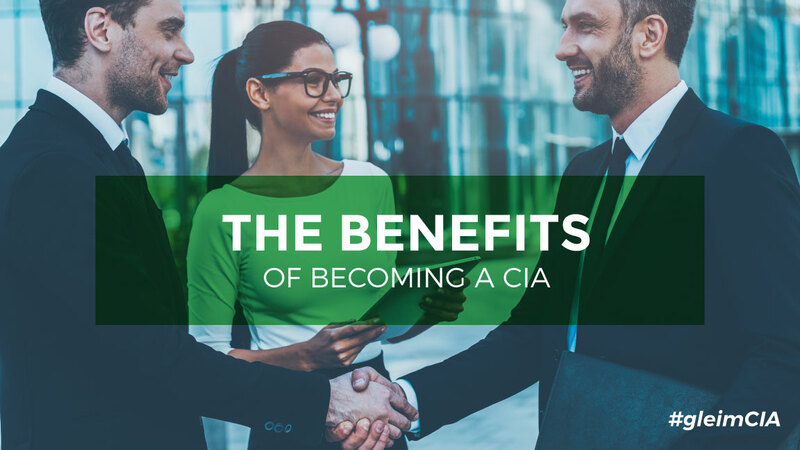 Of course, having a CIA certification means more than just money. A certification will position you for more opportunities for advancement. You’ll have the experience and credentials to become a senior internal auditor, an audit manager, or a risk management consultant. A CIA will help you improve your internal audit skills and earn you additional authority and credibility in the auditing field. It’s one of the in-demand credentials that shows employers you’re accomplished, skilled, and dedicated to your career. The Institute for Internal Auditors is a global organization serving the internal audit community. It provides continuing education opportunities, resources for internal auditors, professional conferences, and publications to assist internal auditors and CIA candidates. The CIA designation is the only globally recognized certification in the internal audit and compliance industry. The IIA develops the CIA exam and sets the standards for excellence in the profession. It also publishes the major guidance for the profession including International Professional Practices Framework (IPPF), The IIA’s Core Principles, Definition of Internal Auditing, the Code of Ethics, and International Standards for the Professional Practice of Internal Auditing. The CIA exam focuses on internal audit topics, such as internal controls and risk management, auditing processes, control frameworks, fraud, documentation standards, engagement planning and procedures, IT and security systems, governance and business controls, and regulatory issues. These topics are spread through a three-part exam process, totaling 6.5 hours. You have the option of choosing in which order you take the exam parts, and many candidates advise taking Part 3 last because it has a more broad, conceptual perspective on auditing and accounting concepts. Gleim CIA Review is the most widely used CIA Review course on the market. They provide the most comprehensive review of CIA exam topics from the The IIA’s exam syllabus. You can take the first step up that career ladder to a CIA certification and a higher salary here by trying the free Gleim CIA demo. In this free demo you will get unlimited access to one full lesson, which includes video lectures and digital books, a test bank of CIA Exam questions, and an online review to help your focus on your weak areas.